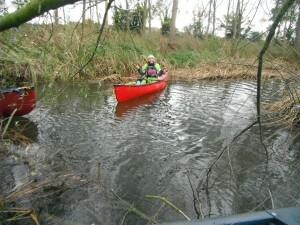 So I put an Email out “anyone fancy a paddle on Saturday” and after a few emails back and fourth Kevin, Clive, Mandy, Ian and Myself (Barry) had decided to Paddle The River Stour from Nayland to Sratford St Marys in our open boats. This was three weeks after the big storm, and as we were sorting our kit out a dog walker stopped for a chat and said that we wouldn’t be paddling far as the river was blocked by a fallen tree! we said thanks for the info and he went on his way. 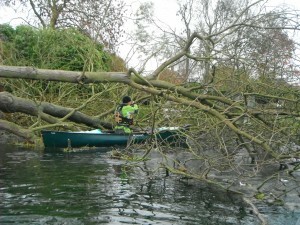 Just through the tunnel, sure enough a huge willow tree blocked the river. Four of us got out and walked around but Kevin decided to go through! 200 meters around the corner another tree, this time the decision was made to go through. With folding saw at the ready through it we went. The next obstacle the box weir, not enough water to paddle over it but the small wave to mess about on at the bottom was fun. Around the corner the next trees one under and one over. Then under and so on. 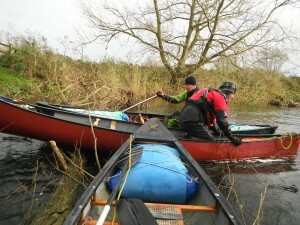 There were so many trees down in the water and across the banks, by the end of the trip we had encountered 13 bank to bank blockages. 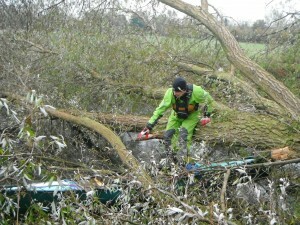 The best one was the tree we had to cut to get in to then climb up and over pulling the boats with us. 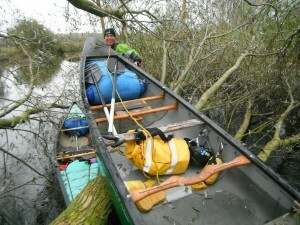 The same trip down the Stour would normally have taken us about three hours this time it took us five. A really strange but fun paddle/tree climb with great company and lots of laughter.